character's statistics, press -> or <- the D-Pad to view them. In this section I will give some brief info about some of the DBZ characters. and extreme strength make him a bad guy smashing machine! a power deep within him never before seen. him he has a burning rage inside him to restore his pride! into the past he warns the Z-Fighter of the androids. Knowledge and power makes him a force to be reckoned with. her time at home, even though she used to be a fighter. helps the Z-Fighters out her amazing devices. is now outmatched and outaged. his third eye and tri-beam attack is definitely not out! now a star baseball player. home planet of the Saiyans long ago. beginning of a new era on Earth... ...an era of darkness! will go away, disobey and follow him by heading forward though. Talk to Gohan, at the end of the chat Gohan will knock you out and fly away. lift off and you'll be taken into Pepper Town. 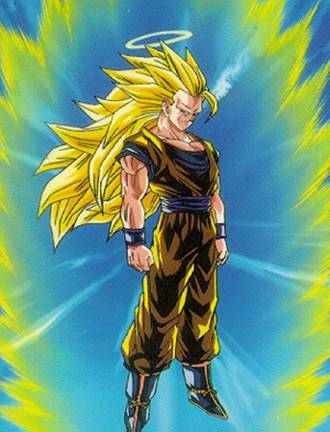 Super Saiyan and the prolouge is over..
dead end, bash in the gate with a 1 on it using the A Button and continue on. head to the right and you'll reach a area with your dad! After a short chat it will be revealed that this is not your dad, but Frieza! the hallway. The phone is located on a table below the stairs in this room. (the Northern Wastelands) and land. Blasts then head to the left. into a meet up with the fellow Z-Fighters. parts. Leave Capsule Corp now and head back into West City. Head across (to the left) two screens and enter the place with all the TVs. if you press select it will scan any enemy you click on in the area. level BA. Collect the Capsules here and now head up to level 3.
now summon a wolf thing.... yippie! then head to the left into a forest like area. and you'll find a kid. Head to the news stand and talk to the guy and you'll recieve a free paper. over to the save point and switch your character to Piccolo. ignored before and cross it. you'll face off against the King Triceratops! lower left corner. Once he's down to 40% HP finish him off with Ki Blasts. bit and head into town. the Warlord's Domain (you have to talk to the guard for entrance). key in a cave protected by a seal, but he removed it, time to get the key! icon after a short talk with Gohan and fly to The East District 439.
and Piccolo then head to Amenbo Island. take the final path, up. be able to recover. Keep attacking and the fight's over . Northern Mountains though... so lets go there! He may have a decent amount of HP, but you only have to drain 20% of it . sure to hit him back and forth side-ways so it's harder for him to recover. Go through the exit at the bottom left and clear the next room of enemies. Turn Super Saiyan, pick up an egg and then run down into the next screen. the open door and destroy the final generator. Head to the right exit and save at the save padm, head back one screen now. Head up on the flight pad and it's time to fight #18! life. Start off by going Super Saiyan then pound her with some melee attacks. here unless you've done some insane leveling with him. Head to the left into the woods, head up, save, and head into another screen. area. Take out all the enemies here and exit down into the Southern Exit. Capsule at the bottom right corner. Exit to the left and head up to cell ^_^. After a short talk you'll control Piccolo . and head up a few screens into a boss battle. him to death, he's not strong at all. Basically Cell is all HP and no attack. your new location to conquer. north. From the next area leave to the left and to the north in the next two. millionth time. Head to the left and destroy the level 30 gate and enter Dr.
Kami's Lookout and into the Hyperbolic Time Chamber. punch away for the last fight and you'll soon win. the level 30 rock, and head up onto the flight pad to Cell! battle. Now that you're not super saiyan this battle should be quite easy. wall a few times. Once his life bar reaches 20% you've won. have to get him around 30% of his life bar down. Head left into the woods. In the fist screen save then head into another. Kill all the enemies here and leave at the left exit into a vertical area. next location to go to is The Tropical Islands. The enemies are a bit harder here so Super Saiyan might help out here. area onto the World Map. Your next area to go to is The Northern Mountains. up and head out the left exit there. Cross the bridge, and save the Namek. Ball lies behind a locked gate in the Northern Portion of this area. the left and right sides and turn on the switches (make sure to save too). where General Tao and Mr. Vodka have the Dragon Ball. over you'll get the last Dragon Ball! Yay! the game for bosses since this is just a bunch of Boss Fights. you get 20% of his hits away he'll blow up the arena. middle of the fight, it's easy though, so no worries. melee attacks and the game is yours basically. quests you haven't done and then go to Dende's Lookout for the ending . see his level 50 gate, beat it to get his statue. gate, beat it and get the statue. a beat the enemies, get the statue sort of thing. TV Station in West City, break the level gate and get the secret ending! #1 - The left side of Kami/Dende's Lookout. #2 - In the Kitchen of the Mayor's House in West City. #3 - In Apartment B of West City (Fourth Floor). bridge there. Head across to get to him. open up the bridge and get em'. #7 - Behind the Level 30 Piccolo gate in the Northern Mountains. putting them here would be too Filler Inducing. Any Missing Data Coming Soon! Wolves are aggresive carnivores and often hunt in packs. These rattlesnakes are extremely aggresive and poisonous. indicated that this robot is desgined for surveillance purposes. However this bug-like robot is also equipped for defense. ruthless and cunning, and often resort to robbery when unemployed. to have defeated this Warlord. The hawk is a bird of prey. Hawks have sharp beaks and acute vision. from attack, and their horns are a dangerous weapon. ninjutsu skills for assassination and thieving.